Why A Duck: The Story Of An Obsession In Five Acts, Act I. A few weeks back, reader David won the latest mystery ship contest. As his prize, he chose to ask "why rubber ducks"? What he didn't realize is that he has opened the vault to an epic tale... and, of course, since it's about me, it'll be fun for me to write about. I mean, who doesn't think of themselves as the main character in the world? I mean, other than self-actualized individuals, that is. So grab a relaxing beverage of your choice, settle in to a comfortable chair, and enjoy The Story! This tale begins, as so many of such things do, with a girl. I was a theatre student at Duck U, around about 1990, living in the tower dorm. Considering that I lived there, I spent very little time actually in my dorm room. Instead, you could usually find me across campus in the theatre building. At that time, the department had a thriving bunch of wannabe directors so it was a rare weekend that didn't have a student-run show going on. Since I was the only lighting design student on campus, I tended to be the guy asked to help... I had that blackbox theater wrapped around my finger by the end of the first quarter, and an excellent stock design that, with just a few changes, could handle just about any show we loaded in. All of that, however, meant that I would spend long hours over there... maybe in the drafting lab, maybe cutting gels, perhaps hanging and focussing lights, or on those really late nights, sleeping on one of the (remarkably comfortable) couches in the green room. There were, of course, mens and womens dressing rooms off the green room, with showers... I learned to keep a couple changes of clothes down there. Sometimes it was just way too convenient. None of which has to do with ducks, or the girl, except in passing. Or explaining why I came dragging out of the elevator onto the 6th floor of my dorm at 3am one late evening. Imagine my surprise when I practically stumbled over... um... let's call her Ann, because that's not her name, sitting on the floor underneath the communal telephone, sobbing at what the person on the other end was telling her. Let's get something straight here: Ann and I were not friends, not in any way that mattered. We were both theatre people, were in the same (small) department, lived in the same dorm, went to the same parties thrown by the same people, but we weren't friends. I suppose acquaintances would be the best way to describe us. Don't get me wrong, we didn't dislike each other or anything like that. We were friendly, but not friends. I surely didn't know her well enough to intrude on her call or anything like that... but she was someone known to me, who had done me no ill in the past, and she was theatre person. So I sat on the couch across from the phone and waited. Even did a little bit of homework until she hung up the phone. I gave her a moment, then asked if she wanted to talk about it. She shook her head, said "family troubles", then gave me a surprised look... one of those "hey, this guy that I don't really know sat here for nearly an hour at ridiculous o'clock in the morning just to see if I was okay" looks of dawning realization. "Thank you, though." After telling her that if she wanted to talk, just to let me know, I went to my room and passed out. The next few days were spent at the Old Home Pond for reasons that currently escape me, but on the way back I stopped at a grocery store to get some stuff for my "beer fridge".... soda, some nukeable food for when the cafeteria was closed, y'know, that sort of thing... and there, in the children's aisle, was a rubber duck. It was yellow, it squeaked, probably floated, and was cute. All the things a rubber duck is for were there in that one particular duck. Right there, even as I do now, I had the thought that a rubber duck is happiness. Much like you can't sing a sad song when playing a banjo, it's very difficult to be glum when you have a rubber duck in your hands. While Ann had not spoken to me of her issues, she was visibly having problems coping with them... so I bought that rubber duck and gave it to her the next day. I refuse to believe that my giving her that little yellow duck cheered her up so much that she got over her problems overnight, but she did start looking and acting better. Coincidence. The semester carried on, blasting by, show after show, resulting in a frazzled and exhausted me by Thanksgiving. As I sat in my dorm room the Tuesday before turkeyday, sipping from a pocket bottle of cheap blackberry brandy while listening to Dire Straits' Love Over Gold cassette in the dim illumination from a string of christmastree lights, Ann walked in (I had the "c'mon in!" sign up on my door). She was leaving for home early, but she wanted me to have... this. "This" was... a rubber duck. A different rubber duck than the one I had given her, it must be pointed out. I thanked her, made sure she was doing okay, and off she went. I promptly named that duck Scooter, for reasons that have disappeared into the mists of time. Actually, that's not entirely true. That duck's name was Scooter, true... but that was not its full name. No, his full name was Scooter... (pause)... the Wonderduck. And now you, my loyal readers, know the origin of my name. This is that original member of The Flock, Scooter the Wonderduck. He's over 26 years old now, and age has taken a toll upon him. His skin is less flexible than it was, and he's not as bright yellow as he had been nearly three decades ago. That black mark on his chest is from when he fell off the dashboard of a U-Haul. Scooter has seen a lot of stuff go down over the years, but he's still the same Duck of Happiness that he was back there in that corner room of the 6th floor of a Duck U dorm. Scooter was not, though, the only duck. There were a few other given to me as gifts while I was a student at Duck U., too... people saw Scooter sitting there on a shelf above my bed, and thought "hey, that's a good cheap gift!" Those duckies made their way to Minnesota with me, but I have no idea what happened to them. Only Scooter made it back to Duckford. I sometimes wonder about those forgotten Ducks of the North... were they happy? Were they loved? Or were they neglected and uncared for? It's thoughts like this that trouble me at night. Next time, Act II and more. Post contains 1201 words, total size 7 kb. 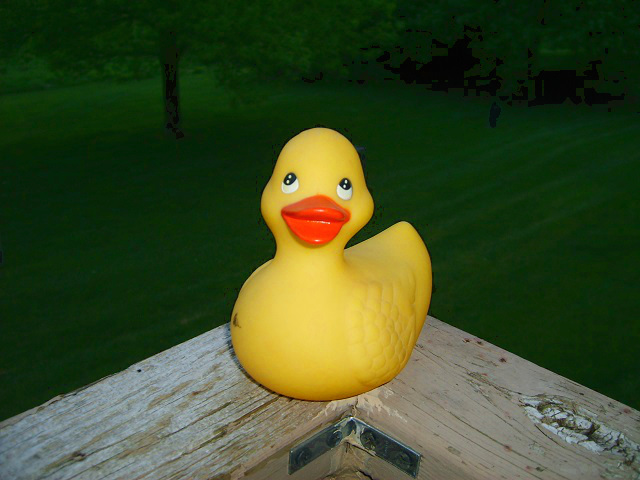 Happiness may not be a rubber duck, but a rubber duck is definitely happiness. 2 Neat story! I'm pretty sure you've shown us Scooter and identified him as the first duck of the flock before, but it's neat to read how you got him, and the flock started. 3 David, back in 2010 was the last time Flock Prime was identified as such. The picture was from the same session, too. 4 Huh. I would not have guessed college. Neat story! 30kb generated in CPU 0.03, elapsed 0.1609 seconds. 49 queries taking 0.1393 seconds, 249 records returned.